In the northwest corner of Nunavut, Canada, a formerly inaccessible bay off of the Arctic Ocean has become reachable through a secret inlet. Untouched by the hands of time and fed by both the ocean and warm fresh water springs, Ridback Bay is teeming with sea life. Acquire licenses,launch boats, and fish the great briny blue. 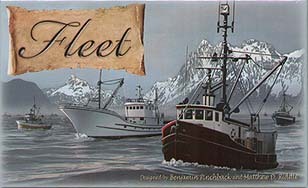 The player who best manages his resources and acquires the most Victory Points via fish, licenses, and boats will build the strongest Fleet and lead his crew to victory.